After leaving the Gnarled Root Dungeon, head right across the bridge one screen, where you will almost certainly encounter Maple for the first time. After Link has defeated 30 enemies, Maple will appear in the next screen Link enters in many areas of the overworld. Bumping into Maple causes many of her and Link’s items to scatter about the screen. Although she can be avoided altogether, it is often more beneficial to bump into Maple in an attempt to gather more items than you lose, some of which are rare items such as Magical Rings, a Magic Potion, or one of the twelve Pieces of Heart. Over time Maple will improve her means of travel, ditching her broom for a vacuum and then a flying saucer. With each upgraded vehicle, Maple will be able to move much faster, making it more difficult for Link to gather more items than her. On this same screen, burn the leftmost tree above the bushes to reveal a staircase leading to an Old Man’s hideout. Enter the hideout and talk with the Old Man who will give Link 100 Rupees. Continue down and left one screen each. If you planted a Gasha Seed here before the first dungeon, swipe down the Gasha Nut from the tree and collect the item inside, then continue south into Horon Village. From the northern entrance to Horon Village, head east until you reach Mayor Ruul’s House and enter. On the right side of the house, toss a bomb at the cracked portion of wall on the right to reveal a secret passage. Walk inside to obtain a Gasha Seed. Head down one screen from the Mayor’s House and jump off the ledge. Climb the steps on the right and burn down the tree to access the first Piece of Heart! Continue south from where the Piece of Heart was obtained, or down one screen from Vasu Jewelers, and then head right one screen to reach Dr. Left‘s house. Inside, use an Ember Seed on the unlit torch. Dr. Left will thank Link by giving him the first item in the Trading Sequence, the Cuccodex! Just outside of Dr. Left’s house, burn the middle tree in the row of three to reveal an Old Man’s hideout. After speaking with him, the Old Man will give Link 100 rupees! Head all the way back into North Horon and go directly east of the Gnarled Root Dungeon and up one screen from the tree stump to find a small, gated house. Inside, speak with Malon, who will thankfully trade Link the Lon Lon Egg in exchange for the Cuccodex to help her with the Cuccos. Back in Horon Village head to the eastern exit, just a few screens right of Vasu Jewelers. The man sleeping next to the fence will awaken and introduce himself as Sokra, a wandering prophet who encourages Link to see out the spirits inhabiting the Temple of Seasons. Burn one of the trees blocking the exit and head right one screen into the Eastern Suburbs. The season will automatically change to Autumn in the Eastern Suburbs. Head up two screens where Link will encounter a couple of new enemies: two Peahats and a Red Pig Moblin. Continue right one screen, where a mysterious cloaked being wearing a ribbon will appear from the east. We later learn that her name is Rosa and that she is of the Subrosian race. She speaks of a “temple” falling into her home world before running off to the north. Follow after Rosa up one screen. Link must hide behind the trees out of Rosa’s line-of-sight to avoid being caught as she will run off if spotted, resulting in having to start the chase over. Continue following and hiding from Rosa north two more screens. In this screen with the tree stump, Link can actually hop on top of the stump and avoid being seen, a result of the game’s added height-detection. When Rosa exits left one screen from here, wait for her to come back for a final look before following after her. Rosa will seemingly disappear into a bush. Cut through the bushes to discover a secret portal underneath the one Rosa disappeared into and walk into the portal to be transported to the underworld land of Subrosia. Subrosia is quite different from Holodrum in that it is mostly covered in red earth and lava. 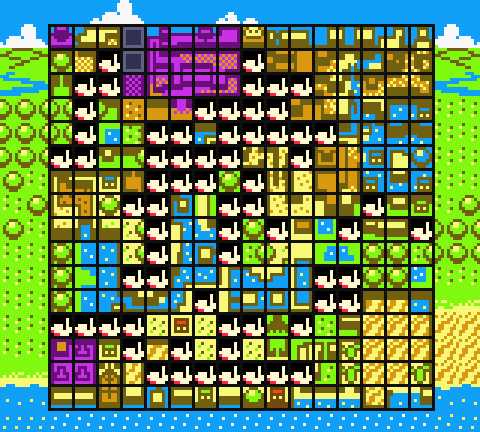 Rupees are also useless here as Subrosians deal in Ore Chunks, the easiest way to obtain them being digging around with the Shovel. Be aware while digging for Ore Chunks that an enemy known as a Fire Pokey may emerge from the ground. From the portal, head down the leftmost staircase below, then continue left one and down one more screen to reach the Subrosian Dance Hall. Speak with the Subrosian wearing red inside who will ask Link if he wants to dance with the group. If Link successfully performs an entire dance routine without messing up even once, he will be awarded with the L-1 Boomerang! Link can continue dancing for a chance to win either a Gasha Seed or 50 Ore Chunks, with each successful performance resulting in a more difficult trail the next time. Eventually, he can obtain a Strange Flute that will later become Dimitri’s Flute. The ability to obtain a Strange Flute does not exist in a Linked Game as whichever animal companion Link acquired during his quest in Labrynna will carry over to his quest here in Holodrum. After leaving the Dance Hall, head back to the screen with the blue portal. This time, walk down the staircase on the right. Continue down two and right two screens, then descend the staircase on the right and continue right for two more screens. Here, Link will find the Temple of Seasons, where Link will be greeted by the Season Spirits. Continue up two more screens and enter the Temple of Seasons. Inside, walk up one screen and stand on the altar to receive the Rod of Seasons! With it, Link can alter the season in an area once the rod has been powered by that respective season’s Spirit. Exit this section of the temple and head down one and right one screen to a large tower, defined by its purple top marked with a symbol representing the Winter season. Walk inside and use the Boomerang or a Bomb to strike the blue switch, turning it red and making a bridge appear. Continue through the temple until you reach the altar of the Spirit of Winter, who will bless the Rod of Seasons with the Power of Winter! Exit the temple, at which point a brief message from the Maku Tree will reveal the location of the next Essence of Nature within the Woods of Winter. Backtrack to the blue portal and use it to get back to the woods. Head right one screen, where Sokra will appear again to explain how to use the Rod of Seasons. Hop onto the tree stump and swing the rod, changing the season to Winter. Enemies will appear throughout the area, one of which is the stronger Blue Octorok. From the tree stump, walk right one and down one screen each. The third bush on the second row from the top will be hiding a soil patch underneath, so you may want to plant a Gasha Seed now before we tackle the second dungeon in a few moments. Head north, one screen right and up from the tree stump. The path to the left leads to a Great Fairy, so heal up if needed, then exit this area up and right one screen each. Head north until you reach a second tree stump. Change the season to Winter if it isn’t already and head through the now accessible path right one screen. The season in this section of the Woods of Winter will change to Summer by default. Among two Red Moblins here is a new enemy, the Like-Like. Toss a bomb at the cracked wall above and enter the cave where Link can find a chest containing 30 rupees. There’s nothing left here, so go ahead and exit the cave. Continue right one screen and use the tree stump to change the season to Winter, then climb the steps on the right and walk right one screen. Hop off the ledge onto the snowy path, then jump into the chimney to enter the house. Speak with Holly, who will mistake Link for Santa before giving him the Shovel to clear the snow from the front of her house. Exit Holly’s house and clear a path through the snow piles using the Shovel, then continue down one screen, where the season will again automatically change, this time to Autumn. There are some trees on the left that can be burned on this screen. The lone one in the back is hiding an Old Man’s hideout and, although it seems the same as those before who have given Link rupees, who you’ll want to avoid this one as he will instead take 50 of Link’s rupees to “fix his door”. Continue on down one screen via the leftmost path. Link will encounter a new enemy along this path, the Blue Moblin. At the end of the path, head left one screen and use the tree stump to change the season to Winter. Continue left one and up one screen along the right side of the trees. Two new enemies will appear from the ground on this screen, the Red Leever and Blue Leever. Use the Shovel to clear a path in the snow piles and head right one screen, where the season will change to Summer. Swipe down the Mystery Seeds from the tree using Link’s sword. The blue owl figure on the right is known as an Owl Stone, which can be found both in the overworld and in dungeons. Climb the vines along the wall ahead and use the stump to change the season to Winter. The frozen pond in front of the leftmost cave below will turn to ice which Link can walk across. The middle bush in this small section of the cave hides a stray fairy which will re-spawn each time Link re-enters. Inside the cave mentioned above will be a Great Fairy who will tell Link a secret to take to Tingle in Labrynna. There, Tingle will reward Link by upgrading his Seed Satchel capacity to 50! As before, Link cannot yet enter the Maku Tree and redeem the reward of this secret in Holodrum, so make note of it as we will be able to use it after Level 2. Continue left one screen, where we finally see the entrance to the second dungeon. Chop away the bushes to clear the entrance to Level 2: Snake’s Remains, and enter. For now, ignore the unlit torches in the first room and head left one screen. Watch out for the Blue Blade Traps that will shoot towards Link while walking into this room. Green Zols will also spawn in multiple locations as you navigate to the left side of the room where a chest containing 5 Rupees is found. Head up one screen and defeat the four Ropes in this room to have a Small Key fall in the center. Grab it, then head back to the first room of the dungeon. Use Ember Seeds to light the two torches, opening the doorway forward. Head up one screen and immediately right another screen through the narrow path. Defeat the Ropes in this room, then push the out-of-place block on the right side of the room RIGHT. Grab the Compass from the chest that appears in the center, then head back left one screen. Head towards the next room up while avoiding the Torch Trap‘s fireballs. Defeat the five enemies in this room to unlock a doorway on the right, but do not enter it just yet. Instead, toss a Bomb at the space of wall which the arrow of blocks are pointing to, revealing a secret passage. Head through, left one screen, and grab all of the rupees laying across the floor. Exit this room right one screen and continue up one screen through the locked door. Knock the two Hardhat Beetles into a pit and head through the opened doorway on the left. You have to throw Bombs at the Moblins on the other side of the room across the gap to defeat them. Time your throws so the Bomb explodes on the Moblins and use the shrubs in this room to restock if needed. When both Moblins are defeated, a chest will appear. Open it to obtain the Power Bracelet, then head back right one screen. Deal with the Hardhat Beetles again, then use the Power Bracelet to throw aside the vases blocking the chest, then open it to obtain the Dungeon Map. Head down one and right one screen each from here. Defeat the two Red Zols and three Ropes, then push the out-of-place block on the right side of the room RIGHT. Head through the unlocked doorway right one screen. Keep moving right in this room, avoiding the Giant Red Blade Trap, clockwise around the path to the chest and grab the Small Key from it. Now walk right along the path, avoiding the Giant Orange Blade Trap, and head down one screen. Use the power bracelet to push the roller to the left, then head down and right along the path to the next roller and push it aside to access the stairs at the bottom-right corner. The stairs take Link outside of the dungeon on the ledge one screen right of the entrance. Grab the Gasha Seed from the chest, then walk left one screen and down the staircase to a separate section of the dungeon. Link will need at least six Bombs in the next room, so buy some from the Business Scrub hidden beneath the lone bush on the left if needed. Cut through the bushes and head up one screen. You have roughly 30 seconds to reach the chest in the middle before it disappears. Walk counter-clockwise along the path, bombing the cracked blocks as you come to them. When you reach the left side of the room, bomb the three cracked blocks near each other and head through the pathway. Bomb the last block to reach the chest and open it to obtain a Small Key. Now, backtrack all the way out of this section, across the ledge, and back into the dungeon to the room with the rollers. Push your way through the rollers and head up one, then right one screen. Watch out for the Ropes in this room and grab some Bombs from the bushes at the top of the room if needed. Bomb the cracked blocks in the middle of the room and head down the staircase on the right to a basement area. Jump off the ladder and head left. Be mindful of the Keese that fly about and walk close to the edge just below the Spiked Thwomp to make it crash down in front of Link. When the Spiked Thwomp hits the floor, walk across his head and continue left one screen. Climb down the ladder and walk left to the opposite ladder without stopping to avoid the smaller Thwimps from crashing into Link. Head up the series of ladders to exit the basement area back into a new section of the dungeon. Push the first roller all the way against the blocks on the right and walk south along the path. Watch out for the Green Zols that spawn as you make your way to the chest. Open it to receive 10 Rupees, then head up along the path and right one screen. Push the first roller right once, then quickly move down to its bottom and continue pushing to avoid standing on the weakened floors. Continue to the next roller and push it from its middle section, avoiding the weakened floors again, until you can access the path up towards the vases. Toss them aside and follow the path to a locked door at the bottom-right corner of the room. Head through the locked door down one screen to the location of this dungeon’s mini-boss, Facade. 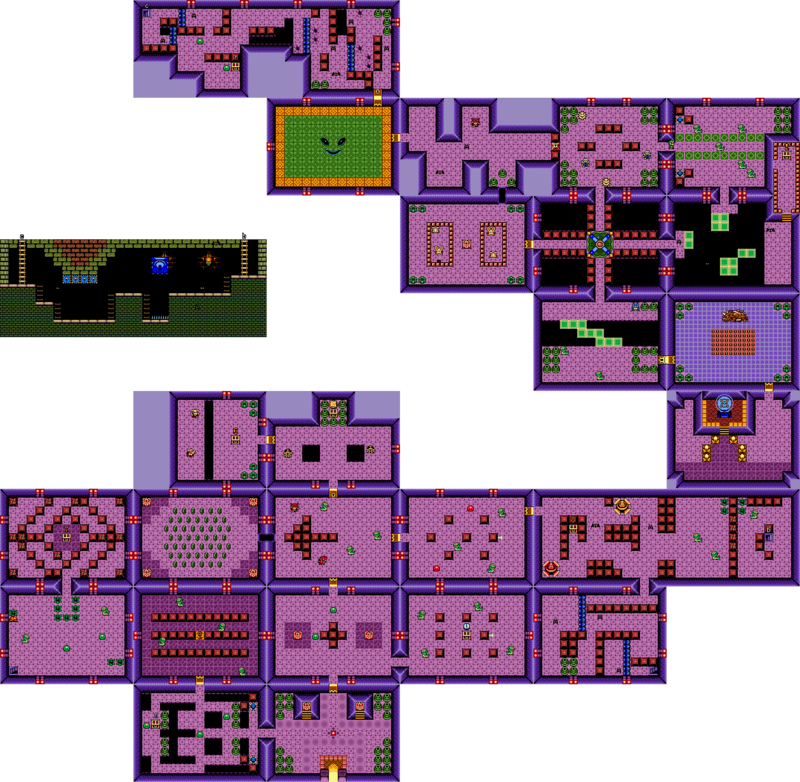 As Link walks toward the center of the room, Facade will appear and remain stationary for a moment before using one of three attacks: Shooting fireballs from its mouth which will crash down in various areas of the room, spawning Beetles from the ceiling which can be defeated to gather Bombs or Hearts, or disappearing and creating holes across the floor that Link can fall into. While Facade is visible, drop a Bomb on its face, the subsequent explosion being the only way to damage it. During Facade’s fireball attack, it is possible to land two-to-three hits with the Bombs if timed well. After five successful hits, Facade will be defeated. After defeating Facade, head right one screen, then continue through the passage right another screen and use a Small Key to bypass the locked block. Two Sparks will move along the walls of the room, so try to avoid them or defeat them using the Boomerang to obtain a Fairy, then continue right one screen. Watch out for the Blue Blade Traps that shoot towards Link as soon as he enters, then defeat or avoid the Ropes and head down one screen. Navigate this room by crossing the moving green platforms counter-clockwise to the path at the lower-right corner. Head along this path up one screen to a ledge with a chest. Open it to obtain the Boss Key, then hop off the ledge and head left two screens back to the passage from before. Toss aside the vases at the bottom of the room as soon as you walk in and bomb the cracked wall. Head through the opening to a room with four Pols Voice hopping around inside of two blocked-off areas. Defeat all the Pols Voice using Bombs, more of which can be found within the bushes in the corners of this room, then head through the now-open doorway right one screen. Enter the turnstile and it will turn left, positioning Link towards the south-bound path. Head along this path down one screen, then cross the moving green platforms to the bottom half of the room. To the right, toss aside the vases to reach the door to the dungeon boss’ lair. If you need some health, a couple of recovery hearts can be found in the vases on the left side of the room. When ready, head through the door to take on the dungeon boss, Dodongo. Though Dodongo moves rather slowly about the room for the majority of the fight, he does have a couple of attacks that will prove fatal if you do not keep an appropriate distance. Occasionally, Dodongo will open his mouth for a couple of seconds before shooting fireballs out in the direction he’s facing. He may also charge towards Link, an attack that is given away by Dodongo briefly running in place before charging. Keep the Bombs and Power Bracelet both equipped during this fight. When Dodongo opens his mouth, toss a Bomb inside to have him “balloon” up. Then, use the Power Bracelet to lift and toss Dodongo onto the spiked floor in the middle of the room. After doing this four times, Dodongo will be defeated. Collect the Heart Container and head down one screen through the opened doorway at the lower-right section of the room to. Walk up the altar steps to claim the second Essence of Nature, the Gift of Time!